Wesleyan Woods reserves the right to add, modify, or delete rules as the need arises. Please check the rules for the latest updates. Management reserves the right to refuse services to anyone for any reason. This is an alcohol free campground. Absolutely no alcohol permitted on camp property. NO smoking in the camp buildings or public areas. Drugs – only prescribed medications are allowed, all others are not permitted. The use of Medical Marijuana is not permitted on camp property. Those with a ccw or cpl may carry their legal firearm. Must be reported at check in. The use of profanity, fireworks and alcohol at any time for any reason is strictly prohibited! Wesleyan Woods, its owners, its managers and employees are not responsible for "Acts of God", other damage, vandalism or theft of registered camper or guest RV's or other personal possessions. It is further understood that Wesleyan Woods Family Campground is not responsible to carry liability or comprehensive insurance coverage on tenants camping units, vehicles or personal property. Due to the inherent risk of camping activities, campers and their guests are responsible for injuries incurred while camping. Campers and their guests must first utilize their health insurance coverage to provide treatment for injuries incurred. All guest must sign a liabilty release form before participating in any activities. All campers must register before going to a camp site. One camping unit per site. One family household per site. Maximum of 8 people on a site. Must allow an unobstructed path which is not less than 4 feet wide and extends completely around the sleeping unit. Two vehicles per campsite. Second vehicle may not obstruct road in any way. If second vehicle does not fit on actual campsite, it may be parked in the Wesley Center parking lot behind the Snack Shop (Gibson). Parents are responsible for the conduct and whereabouts of their children at all times. Campfires must be in designated fire rings, attended and under control at all times. Wood may be purchased at the camp office, snack shack(Gibson) or from camp staff. All black and gray water is to be disposed of in the dumping station or in designated outlets (full hook-up). Trash must be placed in approved dumpsters located throughout the campground. Only household garbage from your RV, generated at our park is to be placed in the dumpsters. Trash must be in a sealed bag and is NOT to be burned or left in the fire pits. Please if you see trash on the ground, pick it up. QUIET HOURS are 11:30 PM – 7:30 AM. Anyone under 18 should be on their campsite at this time. All motorized vehicles (including ATV's, ORV's, Golfcarts, etc.) must be registered at the camp office. Golf carts must be approved at the office during registration. Only licensed drivers or operators with a learner's permit can operate a Golf Cart/UTV inside the campground. Operators with a learner's permit must be accompanied by a licensed adult over 21. Golf carts may not be driven after dark unless equipped with headlights and should be driven only on the roadways. Exception; During East Michigan District Family Camp, no one under 18 is allowed to operarate a golf cart. Bicycles should not be ridden after dark and should be parked on campsites or in designated areas. 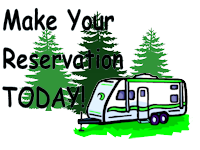 RV check in 1:00pm/check out 12:00pm. Cottage/Cabin check in 3:00pm/check out 11:00am. Pets are not permitted to be loose at any time and must be on a lead no longer than 8 ft., and under control by their master at all times. Pets are not allowed on the beach or in swimming lake. Please keep barking under control. Please clean up after pets and dispose of properly. Pets must have proof of current rabies vaccination. Only certified Service Animals, that are clearly marked, are permitted inside any camp building. All other pets, including Therapy or Emotional Support animals are not permitted inside camp buildings, unless a part of a sponsored therapy program or event at Wesleyan Woods. Any aggressive or aggressive-acting pets, will be asked to be removed from the camp grounds. Swimming in designated areas only (Beach and Water Slide). No lifeguard on duty at the beach. Under 16 must be supervised by adult. No fishing in swimming area. No smoking, Alcohol, or the use foul language. No Pets allowed in the swimming area. A deposit of $50 is required at the time of booking. The remaining balance is due at the time of check-in. Cancellation 7 days prior to stay will be subject to a $10 cancellation fee. No refunds for cancellations made within 7 days (14 days if holiday weekend) of scheduled check-in date. Credit cards (Visa, MasterCard, Discover card, American Express) are accepted. Refunds will be returned the same manner they were paid.